Just another pathetic attempt to try and find a way to win an election from a deceitful and unbelievably ignorant party. Let’s see… We’ll get rid of the electoral college, but just in case that don’t work let’s also allow convicted felons, incarcerated prisoners, and illegal aliens to vote. Don’t worry about the people. Just tell them it’s good for America. Oh, and wait. Let’s allow 16 year olds to vote too, Yeah. That should do it. Apparently they think people are dumb enough to buy into this and the sad part is…If you’ve ever listened to a liberal speak they’re probably right. Well, we’ve seen the left go to GREAT lengths to overturn votes in other states/elections.. THIS Is just their latest attempt..
Aside from being unconstitutional, let’s see what happens when a REPUBLICAN wins the popular vote, but loses the electoral college. The democraps will be all for the electoral college then. OF course they will be for it…. THEY ARE FOR ANYTHING that keeps them in power and denies it to us conservatives. Just remind them that John Kennedy LOST the popular vote to Richard Nixon. If Kennedy hadn’t had the Electoral College, he would have LOST and Nixon would have WON. No Vietnam War, no Draft, the Modern Volunteer Army would have existed earlier, and the Environmental Protection Act would have been passed and signed earlier. Uh, that also means that the tragedy at Love Canal would not have happened, either. Oh, one last thing, Nixon signed the Endangered Species Act. Since the liberals ignore Laws passed and signed by Republicans, PETA ignored the Endangered Species Act and drove two species of songbirds in Boston, Massachusetts and two species of songbirds in Monterey, California to extinctions; gone forever! And their other popular skirt-chasing misogynist, Bill Clinton, also lost the popular vote. George Bush actually won. Once again, it was the Electoral College that allowed a sexual predator President to waste all the money George Bush saved by closing military bases in Europe, by having a Democrat President waste the money on . . . uh, exactly what DID Bill Clinton spend those trillions of dollars on? If we eliminated voter fraud, this may not be a real big problem. However, too many illegals and dead people vote here. Also there are people that vote more than once. HENCE why we need a full on voter registration clean out. B) Must go to your new state’s voter registration offices, when you move, WITHIN 3 months of moving. Fail to do so, and lose your registration for that year. C) PROVIDE Proper ID when you vote. The Electoral College is described in the Constitution. When the Dems hate the Electoral College, they’re admitting they hate the Constitution, which means they hate America. There are precious few portions of the Constitution they actually like. I doubt there’s ANY part of it, other than maybe the 25th amendment (removal of the president) they like.. This Interstate Compact should make the 2020 Election quite interesting, especially if it does get the 270 votes needed. What will happen if, once again, President Trump loses the Popular Vote but wins the Electoral College? Could happen with the Democrats pushing the illegal voting. The Interstate Compact requires the Electoral Votes go to his opponent…but the Interstate Compact is unconstitutional. Could touch off a Civil War with Trump and Republicans following the Constitution while Democrats following Politics, Interstate Compact and usurping the Constitution. I’m thinking a Civil War will happen anyway…especially if President Trump wins both the Popular Vote and Electoral College. The Democrats threw a major fuss in 2016…in 2020 they’ll go for an all-out Coup! 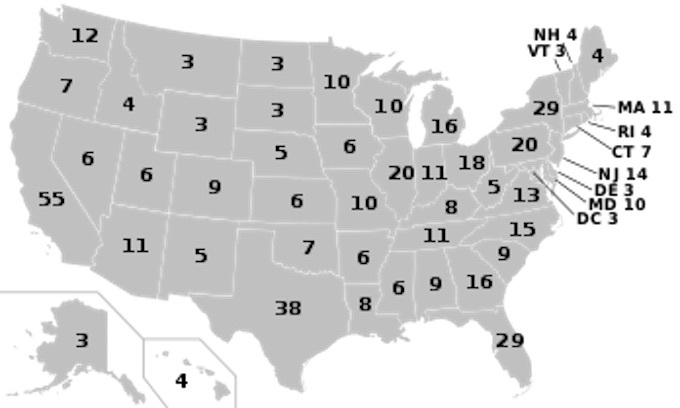 Just to be clear, even if the popular vote within a state is overwhelmingly for “candidate A”, then if “candidate B” gets the national popular vote, that state’s electoral votes automatically go to “candidate B”? So, basically the voters in that state might as well not have voted at all. That is what I have been posting too, the voters in the smaller states would no longer have a reason to even vote. WHICH IS exactly how the dems, want it to be, so only THEIR LARGE Population centers, on each coast, get to control who gets into the white house. FOR Decades they’ve hated “Fly over country”. This is just yet more proof of it imo. Ding-ding-ding, we have a winna! It’s as un-American as it gets. The most serious problem is that such a system completely disenfranchises every citizen in the state — which means that the entire state has been disenfranchised. So when the politicians pushing the program sanctimoniously claim that “every vote should count,” they really mean the opposite, i.e., only the votes in selected states should count. More Republicans — and even constitutionalist Democrats, if there any left — need to point this out. Which is why i can’t understand HOW NO ONE has sued, to make the scotus rule this idiocy is unconstitutional?? the Democrats are always talking about disenfranchising voters for one reason or another. This seems to me the most obvious case for disenfranchising voters by casting the states electoral votes to the other candidate B in this scenario. How dumb do these fools think we are? This is plain crazy. But then again . . . so are they. The Office of the Presidency is so important that the method of election is defined in the Constitution itself. Any attempt to circumvent that method IS an attack on our government and on our way of life. The Supreme Court MUST weigh in on this and strike this down. It will disenfranchise every voter in the smaller states, the very thing the Electoral College prevents. I fear for our future though, The Dread Justice Roberts would probably vote to end America. The Constitution is not a suicide note! It can NOT be circumvented without destroying America! 2: They feel better about cheating with illegals in battleground states, and cheating on the census count, (where its estimated that in CA alone, they get 9 extra Votes in the Electoral college by “estimating” the illegal count towards citizenship), which is a better way than having Red America waking up and overcoming the popular vote idea! Especially since they have PLENTY f their judges, who’ve ruled that we can’t push voter ID laws, or make people answer census questions about their citizenship etc.. THIS IS WHY WE NEED to purge everyone of those judges from the bench! It is a shame that the education system in this country must bear. If they would only spend a some time in 8th grade social studies examining the US Constitution and the originating documents, then maybe the citizens would understand the mechanism for making changes to the Constitution. Here is a clue – it has nothing to do with likes on Facebook or followers on Twitter. OR A POPULAR VOTE! Its not a shame our indoctrination system’s that way, ITS DELIBERATE. Dems. Just think. Lincoln lost the popular vote and was the victor because of the electoral college. You all see him as a good president. The state laws are unconstitutional at best. The Electoral College is there to give all states an even representation in federal elections. Without it, we become another Venezuela, where the people who promise the most stuff to the voters wins, then they default on the promise to the demise of the people. The American electorate proves the reverse to the claim that “The American People Are Not Stupid.” Those less than 50% of voting age eligible that actually vote are obviously ‘stupid to insanity.’ Like lemmings, they are led by the ill-educated and ill-informed. They vote for the next pretty face, or silver tongued devil. The PC culture of the Left, their Socialist/Communist agenda, are as an existential threat, a sort of suicidal impulse fomenting the race of America to 3d World Status….Israel, BTW, has recognized their Left “as an existential threat, a sort of suicidal impulse” and has almost eliminated them! If people don’t start denying the Left crowd their detrimental agenda for America, this ‘former’ Republic will die! they do realize that this would render their opinions and wants WORTHLESS don’t they? As brain dead as many over there are, i am not sure their brains realize this..